Spanish food inspired by tapas bars in and around Barcelona’s “El Mercado de la Boqueria,” in the buzzy Gotham Market at The Ashland. About the décor & atmosphere: This outpost of the NYC tapas spot is a full-service restaurant that occupies a corner of Gotham Market at The Ashland, a food hall in Brooklyn’s Fort Greene neighborhood. 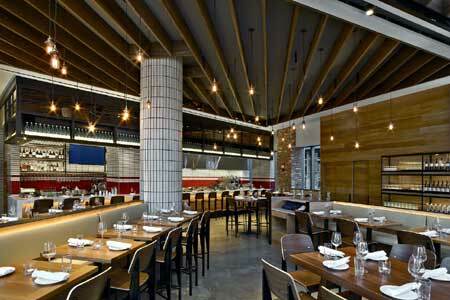 It’s modern and pleasant, with lots of exposed brick and a sleek wooden bar. Likes: Patatas bravas, meats and cheeses; mixed grill; sangría. Dislikes: It can get a bit busy and hectic. 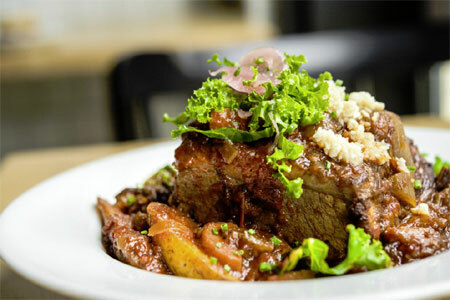 Food & Drinks: Chef Marc Vidal’s shareable plates and tapas-inspired eats are crowd-pleasing and enticing. Start with a pitcher of Rosada sangría, rosé spiked with tequila and sweetened with pomegranate and hibiscus-scented strawberries. A meat and cheese board, served with olives, pan con tomate and raisin walnut bread, is perfect for nibbling, as are briny sardines on toasted country bread and a fluffy tortilla Española, the traditional Spanish dish of eggs, confited potatoes and Spanish onions. There are more substantial dishes, too, like a mixed grill with hanger steak, chorizo and Ibérico pork, and a cornucopia of dipping options including garlic allioli, chimichurri and salsa verde. Paella de mariscos is full of fresh, well-prepared monkfish, shrimp and mussels, but the rice could be cooked for a few more minutes. The wine list features bottles from Spain (where else?). For dessert, sweet, warm churros are dipped in bittersweet chocolate.